Quite often, words are thrown with the same sounding, but when written, the difference is manifested. In most of these cases, the words might mean the same regardless of the spelling. This is mostly manifested because of the variances between the UK English and US English. Such words that have different spellings based on the locality or language are offense and offence. The two words are correct only that they are variants of each other. The act of causing resentment, affront, displeasure, or anger. An infraction or violation of a moral or social code. A transgression of the law, that is, committing a crime. The tactics or means that are used in attempting to make a score, usually in sports. 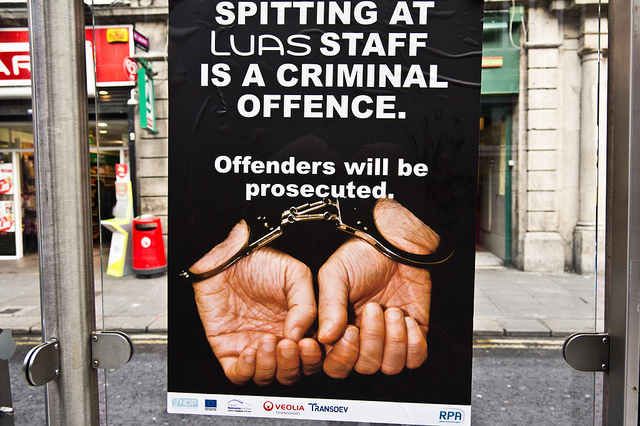 The term offence means an attack, insult, or affront and is applicable or used in UK English. The word offense also means an attack, affront, or insult and is used in the US English. The following are the main differences between the words offence and offense. The term offence originates from the UK English while the term offense originates from the US English. The other major difference between the words offence and offense is in the spelling. The letters “s” and “c” make the variant. Other than the different spellings, there exist no other differences between offence and offense. Apart from the letters “c” and “s” in each word, the major variance is that they belong to the UK English and US English respectively. As for other variations of the words like adjectives, the two words have no differences. The adjectives of both words are spelled as offensive in both the UK and US English. The adjective derived from Offence, in this case, does not have a “c”. Sarah Brown. "Difference Between Offence and Offense." DifferenceBetween.net. 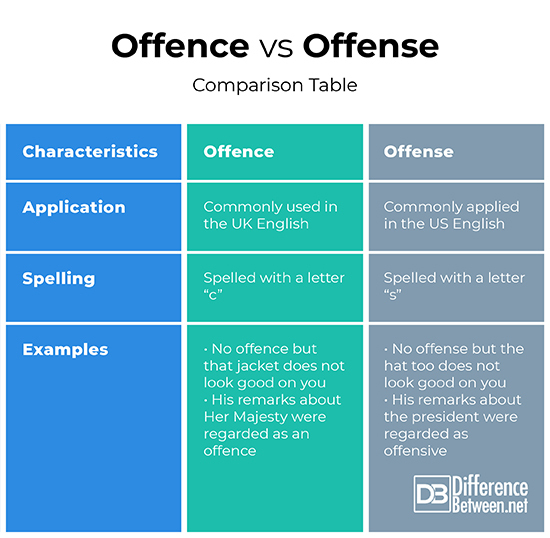 January 17, 2019 < http://www.differencebetween.net/language/difference-between-offence-and-offense/ >. The only thing worse than the Murica crowd is the people who act all ashamed for every regional difference between America and other English speaking regions. It s different because we re different. Get over it. "Offence Vs. Offense – Correct Spelling – Grammarist". Grammarist.Com, 2018, https://grammarist.com/spelling/offence-offense/. Accessed 21 Dec 2018. "Offence Vs. Offense: What’S The Difference? - Writing Explained". Writing Explained, 2018, https://writingexplained.org/offence-vs-offense-difference. Accessed 21 Dec 2018. "Offence Vs. Offense—What Is The Difference?". 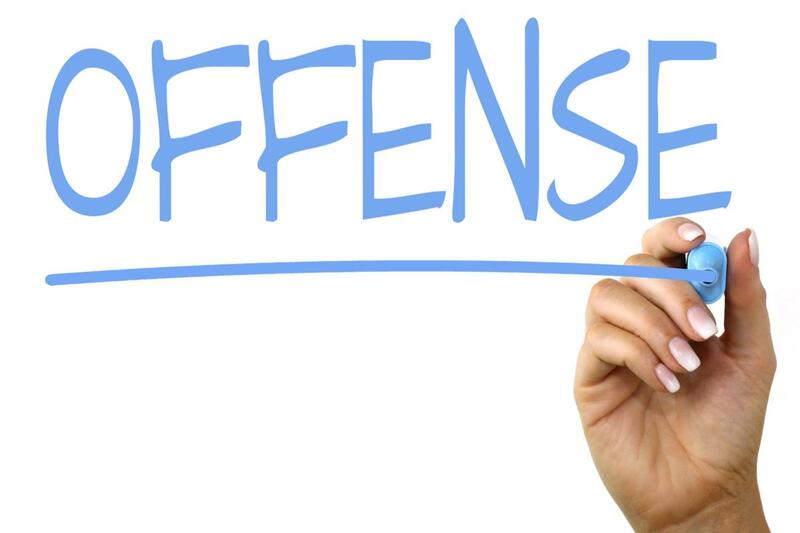 Offence Vs. Offense—What Is The Difference? | Grammarly, 2018, https://www.grammarly.com/blog/offence-offense/. Accessed 21 Dec 2018.